“Wow! This is a side of Jussi Björling that we don’t often encounter, and it is sensational. The great Swedish tenor made a classic studio recording for RCA in 1952 with an unsurpassed, all-star cast—Milanov, Barbieri, Warren. It is a gloriously sung performance, and Björling’s Manrico is vocalized as well as we are ever likely to hear it….There are other live Björling performances that have circulated, and this one has been available on other labels. Richard Caniell has performed his usual miracles with the sound restoration, and there is simply no comparison possible with the editions on Cetra Live Opera, Urania or Myto, which are the ones I am familiar with. The sound here may not quite equal a professionally made 1941 studio recording, but it comes shockingly close. If you know this performance on the other labels, you don’t know it at all. Where there are problems, blame the broadcast engineers (who managed to have Manrico so far off mike in the ‘Miserere’ that we can barely hear him). But the ‘wow’ above is about Björling. The received wisdom is that he was simply a placid actor endowed with a glorious voice and wonderful innate musicianship, and in order to hear the great singing we tolerate a lack of real dramatic involvement. There is a bit of truth in that received wisdom, but not here. Björling on this afternoon in New York was unbuttoned, alive to nuance and fully involved in the drama, all without sacrificing his wonderful legato and sense of phrasing. The excellent annotations by Stephen Hastings points out his virtual explosion on the words ‘la morte’ near the end of ‘Ah! si ben mio’, and on his holding of the final note at the end of ‘Di quella pira’ (a B, as Björling always transposed it down a half tone). Björling’s explosion after the conclusion of ‘Ai nostri monti’ is also quite unlike what we get on his studio recordings, and exceeds his other live performances too. These are not the kind of flamboyant gestures one associates with this tenor, and they add a wonderful frisson. This is a vital, red-blooded Manrico, one who engages us fully in the drama. The other ‘wow’ is for Bruna Castagna, a terribly under-recorded mezzo who had a big career at the Met, singing well over 150 performances between 1936 and 1945, mostly in the dramatic mezzo repertoire. She was a spectacular singer, one who always sang with complete abandon and at the same time a steady, rich, darkly colored voice. She was as capable of floating a soft, beautifully held note as she was of exploding with passion. We would kill to have a Verdi mezzo like this in today’s operatic world. The scenes between Castagna and Björling are memorable in every good sense of that word. A surprise for me was Norina Greco. She did not last long at the Met, giving way in this repertoire to Milanov, Cigna, Bampton, Roman and a few others. The voice is not one of distinction, as Milanov’s was, and she cannot float pianos like Milanov or Caballé. There are some flaws in her Leonora, mainly occasional intonation trouble, but those moments are always brief. She has the high notes (including a brilliant high c-sharp to end the first act), she exhibits an agility that Milanov did not, certainly by the time she made the studio recording, and she is fully involved in the drama and fully engaged with the other characters. She may not be at the level of Björling and Castagna, but she is without question an asset to the performance. Frank Valentino was an American baritone (actually born Frank Valentine Dinhaupt in the Bronx) who was re-christened Francesco Valentino by an Italian impresario who thought he would have more success if he appeared to be Italian. He had a major two-decade career at the Met, one of a long line of American Verdi baritones (Tibbett, Warren, Merrill, Milnes) who made that company their main homes. We cannot pretend that Valentino had the vocal distinction of those others; the voice lacked the sheen and individual sound of importance that they all had. But he was at the very top of the second level, singing with a real presence and understanding of the idiom and an admirable vocal security. Like Greco, he is a real asset to the whole. I had never encountered conductor Ferruccio Calusio until the first time I heard this performance many years ago, and I don’t believe I have encountered him anywhere else. He was an Argentine conductor, and made most of his career at the Teatro Colón in Buenos Aires, and had but one season at the Met. If there are no special revelations in this performance, it is significantly more vital and incisive than Cellini’s work on RCA. This is clearly a conductor who knows the idiom, and believes in it. There are occasional moments where stage and pit are not together, but they are fixed quickly and it is the kind of thing that happens in live performance. But he is clearly also responsible for the tautness evident here, and the fact that this performance is so much more than just great singing. ‘Ai nostri monti’ becomes not just a scene where Manrico and Azucena sing a gorgeous tune to each other, but where there is a real drama going on. We feel Azucena’s detachment from reality, and Manrico’s tender attempt to comfort her. This grips the listener far more than the same scene with Björling and Barbieri on the RCA set. Calusio does employ most of the then-traditional cuts, though he opens the brief duet between ‘Ah! Si ben mio’ and ‘Di quella pira’. “More treasures from the Met! Björling sang the role of Manrico some 67 times between 1935 and 1960, according to the Jussi Björling Society, and left a number of complete recordings. He is in fine voice here….The sense of the thrill of live performance is everywhere here, whatever small shortcomings one might find (there’s the odd point of ensemble here and there). 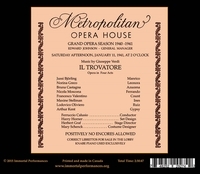 While one may admire the leonine strength of ‘Di quella pira’, not to mention the simple reveling in the voice as climactic notes are extended well beyond their natural length, one surely must gasp equally at the honeyed beauty of tone and phrasing of ‘Il presagio funesto’, sensitively accompanied by Calusio....Even at a distance…Björling’s timbre and overall mastery are readily evident, yet it is in the final scene that he steps into his truest magnificence. Norina Greco’s ‘Tacea la notte’ reveals a singer capable of riding the Verdi’s swelling waves of melody with reserves to spare. 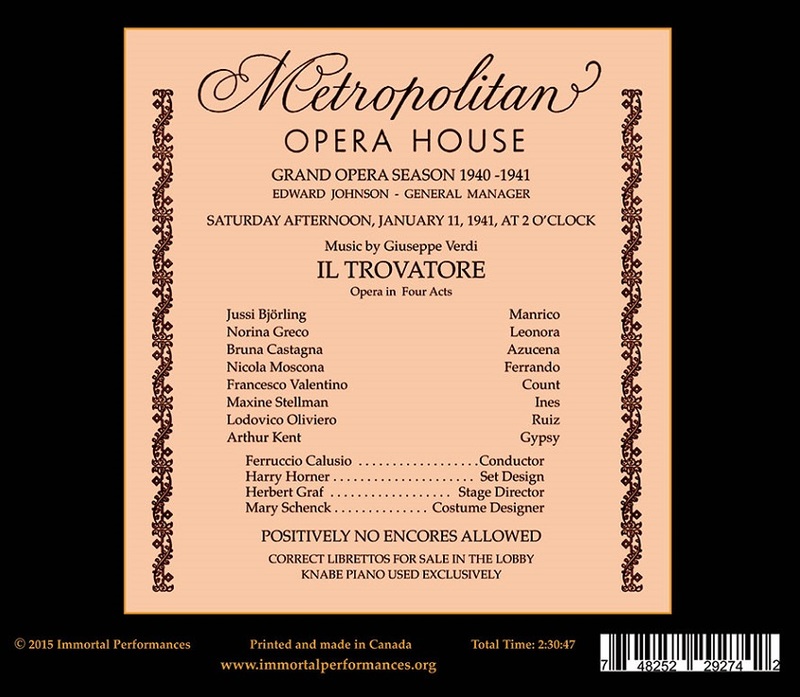 Greco’s stay at the Met was a short one….and, as Hastings points out in the booklet, she had to contend with the likes of Rethberg and Zinka Milanov, but she delivers idiomatic and often exciting singing, not least in the final act. (‘D’amor sull’ali rosee’ furnishes a fine example….She also has vocal flexibility at speed. Maxine Stellman is a steady Ines, but of all the women it is Bruna Castagna’s Azucena that is the most impressive. 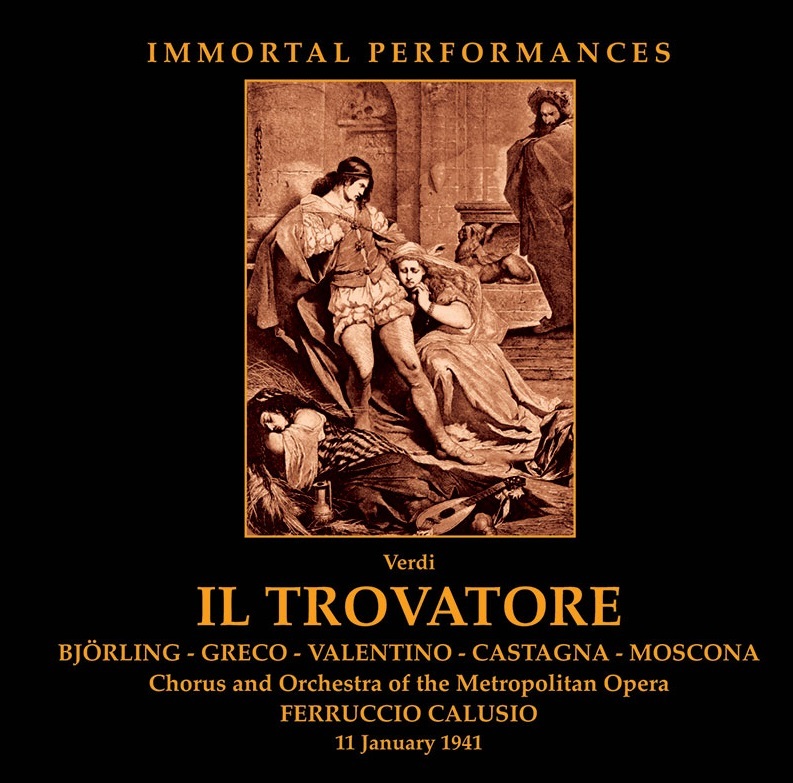 Strong and feisty, her ‘Stride la vampa!’ is a thing of imposing, even intimidating, beauty, and her long narrations in act II are spellbinding....Castagna’s scene with Björling in the opera’s final scene is simply stunning, and in all truth it takes a great tenor not to be eclipsed by her mastery. The bonus, generous as ever, is The Firestone Hour of March 10, 1952, which has never been available complete before. This was broadcast live from NBC Studios at the Rockefeller Center between RCA sessions for the studio TROVATORE (a great link, in my opinion). It is also tremendous fun. Oley Speaks’s ‘Sylvia’, in English with a distinct accent, receives a performance that transcends the piece’s slight stature. Björling spins the line as he would a Verdi melody, while the halo of female chorus around his voice in the latter parts…is surely just sweet….it’s a sweet farewell from a slice of history that just has to be savored.